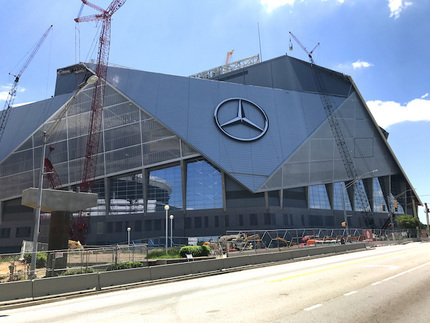 When Mercedes and Atlanta Falcons needed experts to apply the automotive giants brand mark to the stadium – they turned to Principle. The new Atlanta Falcons stadium is one of the most technically complex buildings of its kind with sloping faces and an ocular roof. As main sponsors of the stadium, Mercedes required that their instantly recognisable ‘star’ logo be prominent throughout the site, and from any angle. In addition Principle applied the Mercedes name and more ‘star’ logos to both the interior and exterior of the stadium, which required significant co-ordination and management of both manpower and equipment. All of the logos were fitted, during a complex build programme, without incident and in line with SLA’s. Principle are delighted and proud to have played their part in such a spectacular project and look forward to seeing it on the big stage - Super Bowl 2019! The Principle team were chosen to work closely with the General Contractor and their engineers to design and install both interior and exterior signage, including the complex bracketry needed for 66ft diameter illuminated Mercedes logos.